A striking entrance piece to the town of Bolsover, fabricated from polished stainless steel incorporating water jet cut features which include a life size cutting of one of the largest dragonfly fossil ever found. The wheel depicts the towns association with mining activities and again appears to move using a moirAi?? 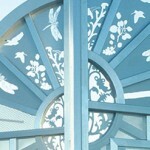 effect created with perforated panels. A accompanying plaque close by aptly states ai??? The past we inherit, the future we createai?? ?